We have recently taken over a range of wood product tests from the Cawthron Institute including tests on wood chips and solid wood products. Steve Molnar will be doing the tests. You can find out more here. 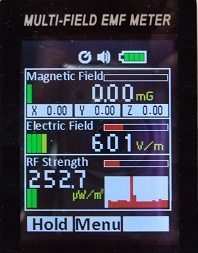 If you're worried about the possibility of health risks from electromagnetic fields in your workplace we can help by checking the levels with our multi-field emf meter. You can find out more about electromagnetic fields here. Working out how much egg is left on your plate after dishwashing can be a challenge but its important to know if you're evaluating dishwashers or detergents. We used image processing software to discriminate between coated and uncoated areas of the test plates and calculate the amount of material remaining. Pete Wilkie has left us to take up a full time position as technical adviser for Solar City. Our program managers will now handle customer liaiason and scheduling of work in their respective areas. We're now approved practitioners under the Gas Regulations 2010 and able to endorse small runs of gas appliances (twenty one or fewer). Click here for more information. 3 August 2014. Better Biosecurity. 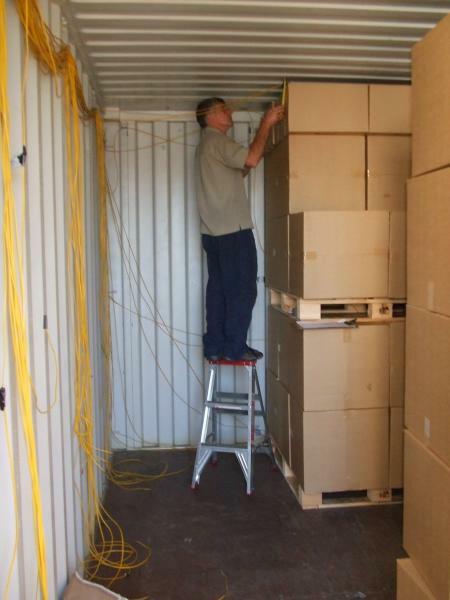 In 2010 we undertook a study of the feasibility of using heat as surface treatment to kill hitch-hiker pests inside shipping containers. This is a potential replacement for methyl bromide fumigation. The study involved measurements of actual heat treatments as well as computer modeling studies. The Ministry of Primary Industries have recently made the results of this study available on line: Heat Treatment of Internal Surfaces in Sea Containers. Turbulence in the air stream from a fan can give it a buffeting feel. The meausrement of 'turbulent intenisty' allows us to quantify this. Our Technical Bulletin 18 - Turbulence in air flow from fans gives more information. 10 March 2014. Fax line. We've discontinued our dedicated fax line. In the unlikely event you need to send us a fax please send it to our main number and we'll redirect it to a fax machine. 6-9 December 2013. Email Outage. Our service provider upgraded their email servers on Friday Dec 6 and we did not receive some emails that have were sent to us in the period Dec 6 - 9 inclusive. We believe this issue has now been resolved. 23 November 2013. Occupational Safety and Health Services. Over the years we've widened the range of testing we provide related to occupational safety and health. We've recently updated our website to reflect these changes. Click here for more information. 8 May 2013. We've joined ISN. As part of our ongoing committment to health and safety we've joined ISN who provide an independent audit of our health and safety systems. 8 October 2012. ARS in the Wind. We have constructed a wind tunnel to enable us to calibrate air flow sensors. The design is based on NASA research which defines the shape of the inlet and exhaust sections of the tunnel required to provide a laminar airflow in the measurement section. The wind tunnel is interfaced to a computer which controls a variable speed fan drawing air through the unit and allows logging of the air velocity data. We're currently using it develop arrays of sensors for investigating the performance of pedestal fans. 10 September 2012. You'll be talking with Pete. Pete Wilkie will be looking after customer liason and planning for us so he's the person to talk to if you need to schedule testing or have a general query about testing. You can find out more about Pete on our staff page. 21 October 2011. Restructuring of Applied Research. Like many companies, Applied Research has found the Global Financial Crisis tough. Over the last three years, the company has been suffering from cash-flow problems. While testing has continued over this period, trading, as for many businesses, has been difficult. As a result tough decisions have had to be made to restructure the business to reduce costs. This has resulted in the need to shed valued staff. Decisions to let staff go are never easy, nor are they taken lightly. They were, however, necessary to secure the long term viability of the testing capability. The slimmed down team will continue to offer all of the tests that it has been performing in the past: solid fuel heater safety, emissions and efficiency tests; testing of solar collectors to AS/NZS 2712; consumer products testing; as well as expanding the testing of gas appliances. The remaining staff are being trained to have multi-disciplinary skills. Each team member will have a specialisation, but will also be able to carry out testing in a range of areas. Cross-skilling in this way has a further benefit, in that it will allow more staff to work on an area when it gets busy. You can find out more about the staff here. 12 December 2010. But Does It Leak ? 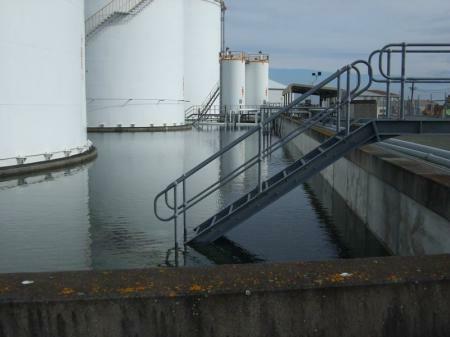 In the unlikely event that fuel or storage tanks fail regulations require that there is a "secondary containment system" or bund to contain the liquid. These must be tested periodically to make sure they don't leak appreciably. The test involves flooding the bund with water and calculating the loss rate after correcting for evaporation and rainfall (sometimes quite a tricky calculation). We have specialised equipment to carry out these tests and our staff hold Site Safe passports and are familiar with working on hazardous sites. A recent consumer product test involved a novel method of cooking that resulted in an excellent product. 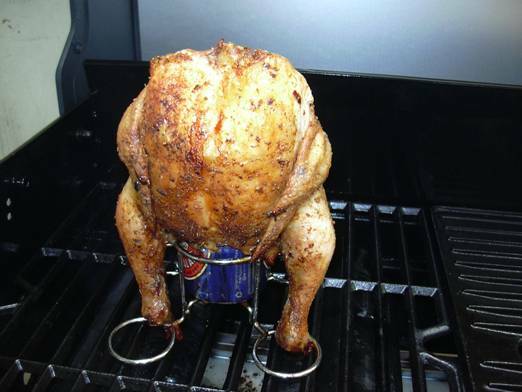 Our staff were happy to check the results when whole chickens were cooked on barbecues using the beer-can method. This involves cooking a chicken by covering it in Cajun spices then inserting a half-full beer can into the chicken so that the meat stays moist and flavoursome. Recent testing of the thermal properties of shipping containers and their loads saw George Looman become a serious boxer. In order to test heat transfer within the load George had to fill a container with 278 cardboard boxes that he had previously filled with waste paper. We have put George up for selection for the next Commonwealth Games.